In the Bay Area it’s not unusual for a house to be painted a non-traditional color or colors. 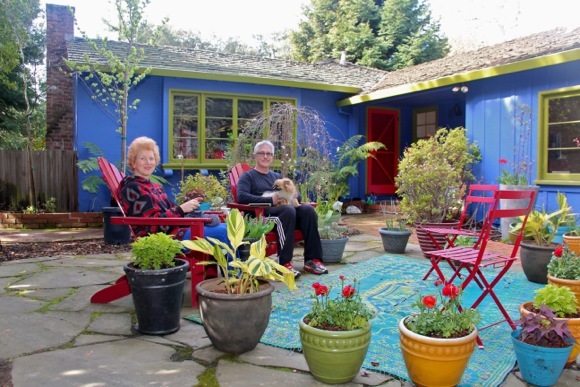 But here in Menlo Park, there is a house that has gone beyond just color: It’s a house plus garden that together presents an enchanting picture for the passer-by. A typical reaction is “it makes me feel happy.” It reminds children of a play house. And for everyone it seems to trigger positive emotions. Here is the story as to how this work of art came to be. Twenty years ago Tom and Becky McDonough moved into their house on a quiet, shady stretch of San Mateo Drive that Tom (Menlo-Atherton High School class of ’78) grew-up in. The yard was in really bad shape, so, initially, doing something about that was the highest priority. About six years ago, with the help of super landscaper Sabino Zubillaga, the McDonoughs began working to create a low maintenance, water-conserving yard. The end result features a large amount of hardscape, perfect for displaying potted plants. But there was more to come. Becky’s mother enjoyed art, but in later life lost her eyesight, and thus the pleasure she derived from art. Becky says this is probably why she herself has always been intrigued by color. Both Becky and Tom do artwork from time to time so once the upgrade of the yard was completed, they decided they wanted a blue house. But when they started painting, it looked more like Barney purple. They quickly realized that wouldn’t work! So they turned to the Benjamin Moore website, which has an app allowing users to audition various colors on house structures similar to their own. They settled on water hyacinth, a retired color that Gray’s Paint in downtown Menlo was able to custom mix from an old swatch they had. The trim color is celery. One thing led to another. One day they decided to paint the open-rail fence along the street a version of celery. 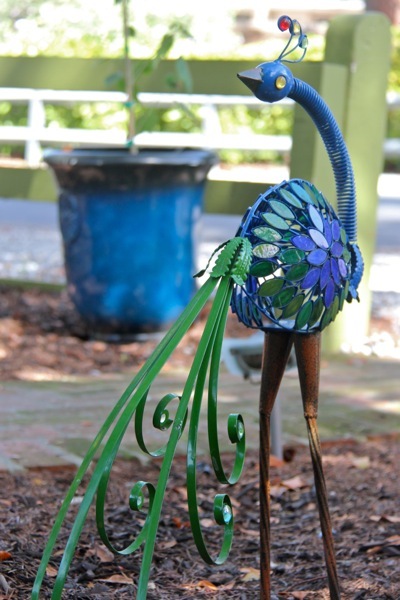 Becky began acquiring large, colorful pots with interesting plants that she distributed around the yard. Some outdoor furniture in coordinated colors was added, along with some objects (like the peacock pictured). The pots and furniture are moveable, so the picture can easily be fine-tuned. These days the McDonoughs enjoy stepping into this enchanting picture they’ve created — dressed in appropriate colors of course — to enjoy a cup of coffee, read a book, or chat with the curious who walk by. What will be next? I love a happy house! Love the color~it makes me smile.